Safe'N'Sure Deluxe PSP Barrier Envelopes are great for phosphoropus plates and now come with the Flow Dental EZ-Glide loader. This allows for quick and easy sliding of the film into the envelope. Then just peel back the tab, and the envelope seals itself. 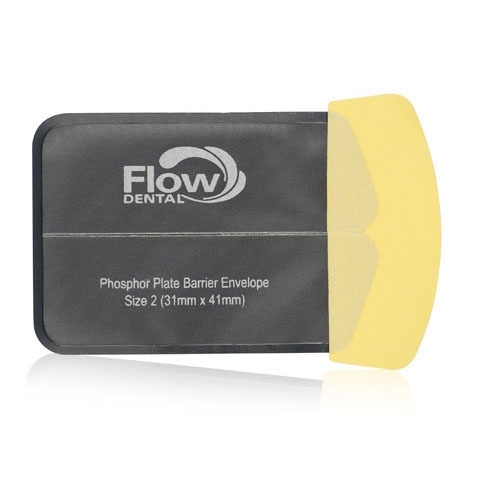 Clear vinyl face allows clinician to visually confirm direction of the plate and an easy-tear center seam allows for quick and easy plate removal. Safe-N-Sure Deluxe Barrier Envelopes come in sizes 0, 1, 2 and 3. Please use the drop down menu to make your selection. 300 barrier envlopes per box.